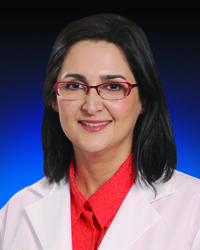 Mahsa Mohebtash, MD, is medical director of the MedStar Franklin Square Cancer Center at Loch Raven Campus and chief of medical oncology and hematology. Fellowship-trained in medical oncology and hematology at the National Cancer Institute at the National Institutes of Health, she is board certified in medical oncology, hematology and internal medicine. Dr. Mohebtash has extensive experience treating all types of cancer particularly breast, lung and colorectal cancer. Her clinical interests include cancer immunotherapy and cancer vaccine research and she runs a variety of clinical trials for several tumor types. Dr. Mohebtash is a member of the American Society of Clinical Oncology, the American Society of Hematology, the American Medical Association and the American College of Physicians. She serves on the Georgetown Lombardi Cancer Center Clinical Research Committee which oversees MedStar Health's oncology research program. Dr. Mohebtash was named a Top Doctor in Baltimore magazine for general oncology and breast oncology in 2015, 2016, 2017, and 2018.